Friday, Sep 7, 2018, 7 – 8:30 p.m. Twilight is that time when people-activity in the Arboretum quiets down and we get to view this enchanting place in another light. 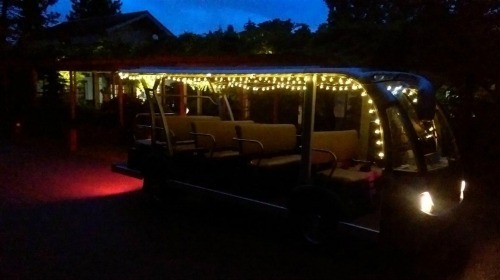 Our open-air tram offers the ability to glide through the early evening hours in ease and explore the changes that start to occur as the sun goes down. Dr. John Wott, Director Emeritus, will lead this journey through the many plants in the Arboretum’s world-class collection, while sharing the history of the park. Dr. Wott served as Arboretum Director from 1991 to 2004 and continues to serve as a passionate leader, teacher, and advocate for our programs and collections. With any luck, along the way on this special tour of the plant collections, you may have an opportunity to get acquainted with our resident nocturnal fauna, including bats, raccoons, and owls. Come along to relax & enjoy this adventure with us! The tram is equipped with lap-only seat belts, which all passengers are required to use throughout the ride. We cannot accommodate child restraint systems or passengers under 40 pounds (except in cases of emergency), in accordance with Washington State law.